The year-over-year gains have been especially impressive with the November figure being 1.801 mmbd. And this number only includes crude oil. Other supplies (liquids) that are part of the petroleum supply add to that. For November, that additional gain is about 500,000 b/d. 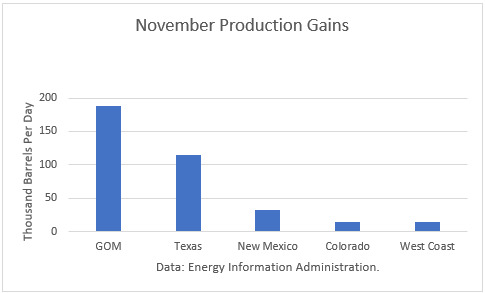 The gain in November was led by a 188,000 b/d increase in the Gulf of Mexico, a 115,000 b/d rise in Texas, a gain of 32,000 b/d in New Mexico, a 15,000 gain in Colorado, and a 14,000 b/d rise on the West Coast. Weather factors affected the overall gain, as production was restored in the GOM following two months of disruptions. 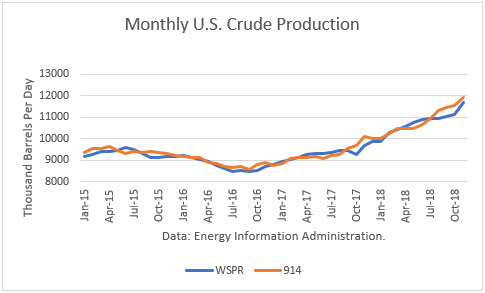 The EIA-914 Petroleum Supply Monthly (PSM) figure was 207,000 b/d higher than the weekly data reported by EIA in the Weekly Petroleum Supply Report (WPSR), averaged over the month, of 11.693 mmbd. The November figure was also 140,000 b/d higher than the 11.760 mmbd estimate for that month in the January Short-Term Outlook. That implies a potential upward “rebenchmarking” to EIA’s model in future production levels. 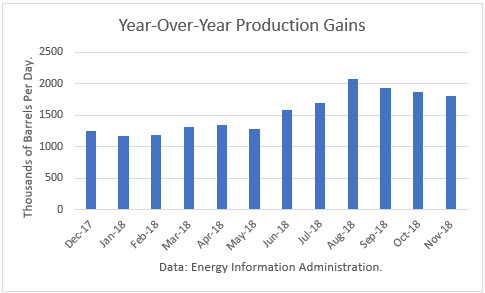 The EIA had been projecting December 2018 output of around 11.240 mmbd for much of the year. Instead, it will be around 12.0 mmbd. 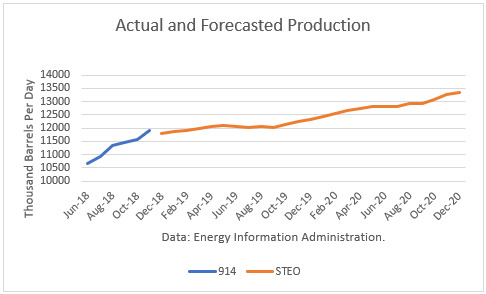 The EIA is projecting that 2019 production will average 12.068 mmbd. As shown below, the growth rate is very slow through 2019. 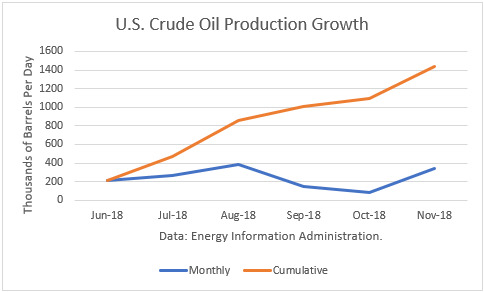 Shale oil production continues to exceed expectations that have been revised upward substantially. The drop in crude price could have slowed down the rate of growth. However, with WTI futures well above $50 now, EIA’s 2019 forecast still looks overly-conservative.